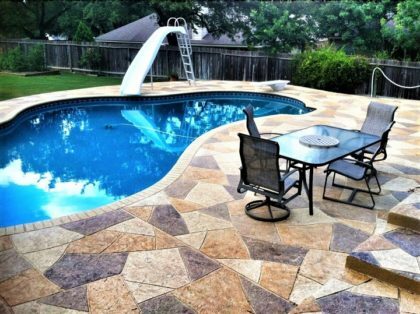 >Decorative concrete is such a nice addition to your backyard design. Although affordable, it is elegant, durable, and long-lasting. But all those won’t happen on their own. In order to keep it beautiful and to make it last longer, you need to clean and maintain it as it should be. The great thing about stamped concrete surfaces is that they require minimal maintenance. But still, here are helpful tips to make sure the stamped areas in your property stays in good shape for a very long time. A concrete sealer is a crucial element in maintaining and extending the life of a stamped surface. The changes in seasons, dirt and debris, and even foot traffic could wear out your patio, pool deck, and other surfaces. Concrete has pores that water, chemicals, and dust can penetrate. If they do, they could weaken the slab itself. A sealer will prevent that from happening. It lasts about a couple of years before you have to re-seal again. A stain on a concrete surface is one of the worst things ever. That’s why if you see one, address it immediately. If you are having a barbecue in the backyard, for example, have a rag ready for spilled barbecue sauce. This way, you could immediately wipe off most of it, reducing the chances for it to sit in and make a permanent stain. You may use hot water or a gentle cleaner to remove it after the party. Use a soft brush to reach the grooves. If water puddles on one part of your stamped concrete surface, it means it has no way to drain out and it will stay there until it evaporates. This could be harmful to the concrete because it could promote the growth of mold and mildew. Both have the tendency to weaken concrete. It may be a bit beneficial to use during winter but it is very harsh on a stamped concrete surface. If you need to enhance traction on your outdoor concrete, use sand instead. It does the same thing but it won’t embed itself on the concrete and wreak havoc. Basic cleaning should be done regularly so as to keep your stamped concrete surfaces in the best condition possible. If you are busy, hire someone who could come in to clean and maintain it. Keeping your concrete surfaces in good shape is a way of protecting your investment. Outdoor concrete spaces are part of your property so it will affect the property resale value as well. It may take a bit of your time but trust that it would be all worth it in the end.